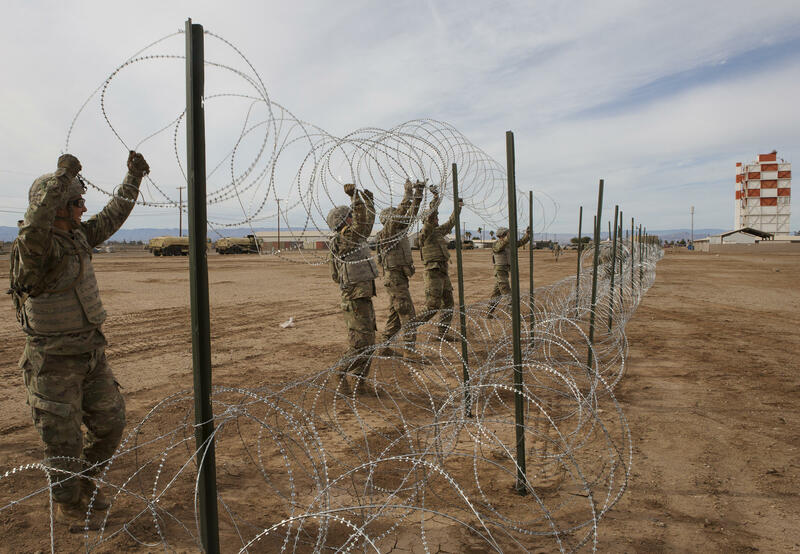 U.S Soldiers with 541st Engineer Company, Special Purpose Marine Air-Ground Task Force 7, position concertina wire on a practice barricade at Naval Air Facility El Centro in California. “We will support our neighbors where the need for assistance is great, and we will offer a helping hand when we can to those vulnerable people who arrive at our border, but New Mexico will not take part in the president’s charade of border fear-mongering by misusing our diligent National Guard troops,” wrote Lujan Grisham in a statement. The withdrawal includes approximately 120 National Guard soldiers from other states, who will pull out within the next 45-60 days, according to her office. That includes a single soldier from New Hampshire, who volunteered for the mission and arrived in New Mexico two weeks ago. A spokesperson for the New Hampshire National Guard says the soldier is a radio communications specialist who is working in an operations center. He has had no contact with any immigrants or detainees, according to the spokesperson. It isn’t clear if the soldier from New Hampshire will return home, or deploy to a different region along the southern border. The National Guard says Sununu was notified of this soldier’s volunteer request for placement on the border. After being halted for nearly a year, construction of two aircraft hangars at the Pease Air National Guard Base is set to resume next month. Work on the hangars stopped in December 2016 when the New Hampshire National Guard terminated the nearly $32 million contract with Cutter Enterprises, LLC of Connecticut for what officials say were problems with the quality of the work and failure to make sufficient progress. MANCHESTER, N.H. (AP) - About 120 members of the New Hampshire Army National Guard will be home in time to celebrate the New Year. The members of the 3rd Battalion, 197th Field Artillery Regiment, are scheduled to arrive Friday afternoon at the Manchester armory. Another 100 soldiers will be coming home the next day. The troops deployed to the Middle East as part of Operation Spartan Shield, a training mission coordinated by the U.S. Army. The New Hampshire guard members conducted artillery training.